Explore the best of Washington DC on this 5-hour tour including reserved entrance to the U.S. Capitol Building! After an in-depth tour of the U.S. Capitol, you'll continue through the city to discover some of DC's most famous landmarks and attractions. With guided walks and plenty of photo opportunities, you'll see best of DC on this deluxe half day tour. Begin your tour by meeting your tour guide and fellow tour members at the Neptune Fountain, located outside the Library of Congress. Cross the street to enjoy exclusive reserved entry into the U.S. Capitol Building, skipping the long lines and hassle. After security check, enter the headquarters of America’s legislative branch of government and enjoy a 15-minute orientation film. 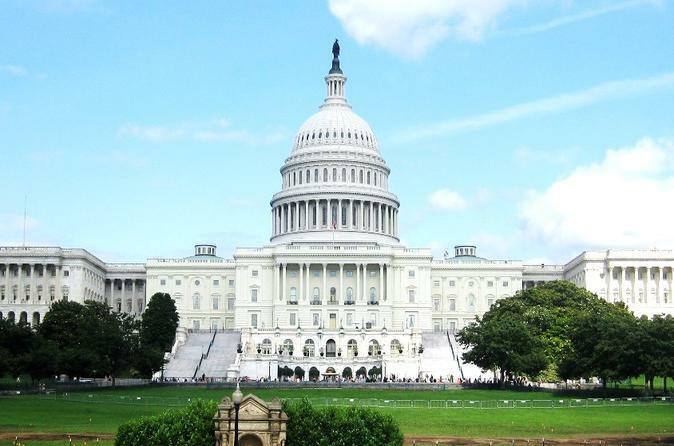 Learn about the foundation of the United States Congress, then proceed to a historic guided walk-through of the Crypt, Rotunda, and National Statuary Hall. You'll even have time to stop by the visitor's center at the conclusion of your tour. After time in the Capitol, meet your tour guide and hop aboard a comfortable, enclosed, temperature-controlled shuttle for a memorable journey through the National Mall. Along the way, stop and view the White House from the North Lawn, and see the World War II Memorial, Martin Luther King Jr. Memorial, Lincoln Memorial, Korean War Memorial, and Vietnam Memorial. Learn the history and significance of each landmark and take some time for memorable photos of your visit. Your 5-hour guided tour concludes at the U.S. Navy Memorial.